This week we welcomed a new family member of the canine variety. 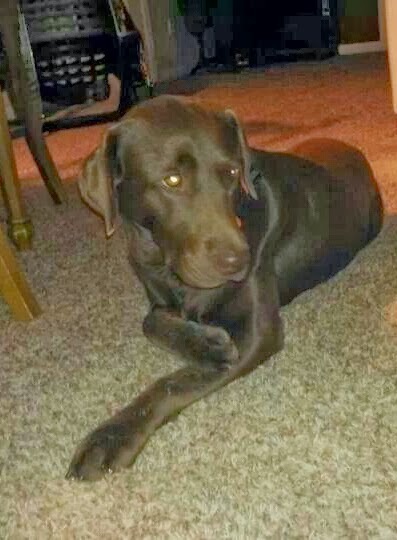 Java is a chocolate lab and was specifically trained to mitigate autistic behaviors. In our case, Java was trained to be tethered to Ryan during public outings and sit and hold Ryan if he tries to bolt or run away; to scent track Ryan on command if he sneaks away when off-tether; and to apply deep pressure with his paws to calm Ryan in the event of a meltdown. I have anxiously awaited Java’s arrival in hopes that our family’s life can take on a new normalcy when we have an extra pair of eyes and a highly trained nose to help keep Ryan safe. I began thinking about a service dog for Ryan almost a year ago. I spoke with a woman who had moved to Hawaii from the Mainland and she raved about how much life had changed for her son and their family since getting their dog. Her son no longer attempted to bolt away during outings, was more sociable with other family members, and was more verbal. Besides the obvious safety issues associated with autism—wandering, bolting, imperviousness to danger—it seems the dogs elicit speech in autistic children. Children will talk to their dogs even when they won’t speak to others. In addition to keeping Ryan safe, I hope he will help Ryan in other ways. This makes me very hopeful for Ryan who is minimally verbal. Ryan is also severely apraxic, which means the signal doesn’t travel from his brain to his mouth for him to properly form words. Most of what he can say I would classify as “word approximations” to indicate what he wants. He is not conversant in any way and has only recently been able to answer “yes – no” on a fairly reliable basis to indicate his wants. Speech is very difficult for him but I am hopeful that Java will be a powerful motivator for Ryan to make the gargantuan effort to speak more. Service dogs fall under the Americans with Disabilities Act, or ADA and are allowed in public places to include schools—provided they are not a disruption. Ryan’s school has been very welcoming, something I appreciate very much. 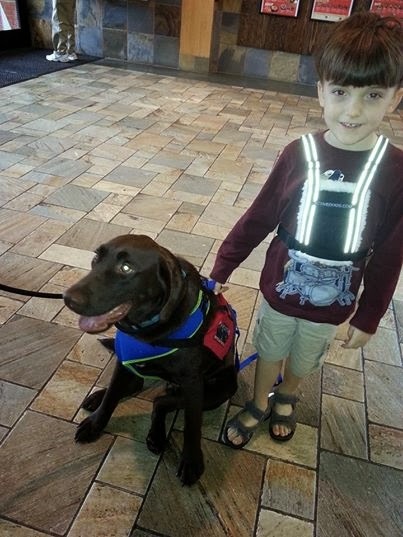 To be classified as a service animal, the dog must be trained to do at least two physical tasks for its owner. Being a calming presence would not qualify as a physical task; dogs whose sole function is to provide comfort or emotional support do not qualify as service animals under the ADA. Comfort and therapy dogs are not considered service dogs under the law. 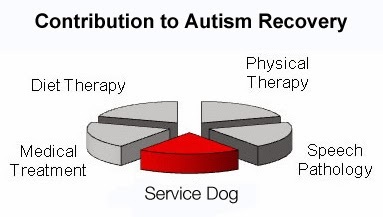 There were no providers of Autism Service Dogs in Hawaii—only comfort or therapy dogs, so I located an organization on the Mainland called “Pawsitive Solutions”, a 501(c)3 non-profit organization in California that specializes in training dogs to assist autistic children. In addition to the tasks our dog was trained for, Pawsitive dogs can be trained to detect gluten or the presence of other allergens in foods; detect low blood sugar; stop self-injurious behaviors and stimming; and provide seizure alerts. I’m amazed at how capable these dogs are. Service dogs are trained for over a year to learn impeccable manners and perform their tasks and they are an expensive investment for a family to make. I’ve seen prices range from $12,500 to $25,000 for the dog, plus the added cost of training the family in using the animal. To help offset the cost, there are websites, such as gofundme.com or crowdtilt.com that can help you get the word out for friends, family or even strangers to contribute to your cause. Pawsitive had many helpful suggestions for fundraising ideas…and there are always the tried-and-true bake sales and car washes to help get the necessary funds. I am placing a lot of hopes on Java’s shoulders. I hope Java’s presence will mean I can use the bathroom without fear Ryan will escape. I hope I will no longer be gripped with worry that someone has forgotten to latch the front gate. I hope that being distracted for a few minutes while I tend to other children will not be cause for concern. Overall, I hope Java will help us with the difficult task of keeping Ryan safe. Ryan and Java--they make a good team! Most of all, I hope our lives will regain some of the normalcy that autism has taken from us. Hello, We posted this on our Facebook page, For the Love of Service Dogs. Please visit us and enjoy all our posts! Thanks for sharing your story!! Here is a link for your convenience.